Why would a man who has been stripped of the use of his legs, arms and voice go through a rollercoaster-style jet aeroplane ride that simulates weightlessness and often leaves even the young and virile sick to their stomachs? For public awareness, says celebrated British cosmologist Stephen Hawking in an interview before his scheduled ride on Thursday on a microgravity-inducing plane. "I think the human race doesn't have a future if it doesn't go into space," he told the BBC News website, who communicates by twitching the one muscle he has control of - his cheek - to select words on his computer. These are then verbalised by a voice synthesizer. "I therefore want to encourage public interest in space. A zero-gravity flight is the first step towards space travel," he said. Hawking, 65, was a young and brilliant graduate student when he was diagnosed with the progressive and incurable motor neuron disease amyotrophic lateral sclerosis, which affects the nerve cells in the brain and spinal cord. 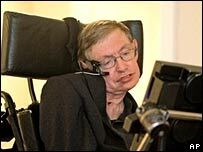 At the time, he did not think he would live long enough to earn his doctorate, but the disease's progression slowed and Hawking was not only awarded his degree but went on to become one of the world's most erudite theoretical physicists. Hawking has a particular penchant for black holes, a topic he discusses in his best-selling book A Brief History of Time. "My work on black holes began with a 'eureka' moment in 1970, a few days after the birth of my daughter, Lucy," Hawking said during a dinner speech on Wednesday night. The 65-year-old realised he could apply theories to black holes that he had developed to explain other puzzling states of matter and energy, particularly ones where the laws of physics seemed to break down. Of all the mysteries of the Universe, however, the Lucasian Professor of Mathematics at the University of Cambridge said he was most intrigued with why the Universe is so big, so smooth and yet just perfect for humans to exist in. "I'm not religious in the normal sense. 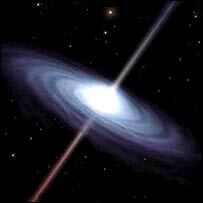 I believe the Universe is governed by the laws of science. The laws may have been decreed by God, but God does not intervene to break the laws," he said. Hawking will test at least one of those laws on Thursday, when he plans to defy gravity - for a moment anyway - by floating during one or more parabolic manoeuvres aboard a specially modified Boeing 727. The plane, operated by Florida-based Zero Gravity Corporation, will take off and land from the space shuttle's runway at the Kennedy Space Center. Hawking's aides will place him gently on the floor of the plane during the sharply angled climb up into the sky, then watch him float up as the plane dives down. Nasa uses a similar technique to prepare astronauts and test equipment for space flight. If Hawking does not suffer any ill effects from the ride and wants to experience additional minutes of weightlessness, the pilots will continue making parabolic manoeuvres. Hawking also has a reservation for a suborbital flight with Sir Richard Branson's Virgin Galactic venture, which is scheduled to begin service in 2009. Virgin Galactic will own and operate at least five spaceships and two mother ships, and will charge £100,000 ($190,000) to carry passengers to an altitude of about 140km on sub-orbital space flights.